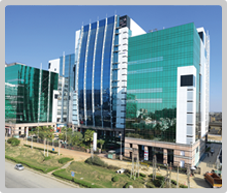 Cyber Greens, a LEED Gold Certified building, is spread across an area of 0.91 mn sq. ft. The complex constitutes five blocks each scaling to 11-19 storeys. Located just off National Highway-8 at the entrance of Gurugram, this "INTELLIGENT IT ENABLED WORKSPACE" is well connected to domestic and international airports and South, Central and West Delhi. Cyber Greens is the first project where DLF pioneered the concept of having amenities block and provision for break-out areas. Designed by the renowned architect Mohit Gujral, the architecture incorporates large, efficient floor plates, wide column span and high floor-to-floor clearances, for optimal space utilization. It provides necessary facilities like multi-cuisine food court with a seating capacity of 700, health club and ATMs for the ease and convenience of its tenants.